Rewarding things are often challenging. Going wireless is no different. Compared to running an HDMI cable over a great distance, running a wireless signal might seem like it’s easy by comparison. But there are almost always special challenges to running a proper wireless setup, especially if you want to avoid issues with your connectivity. It’s pretty simple to choose the right HDMI transmitter. The most important criteria you need to consider is the total range of the HDMI signal. 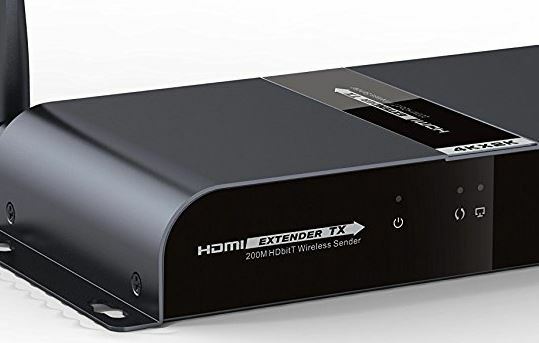 Knowing how far you need to transmit, you’re already 90% of the way to finding the right HDMI transmitter/receiver kit. The rest is mostly a matter of detail, and thinking about whether you need to scale your transmission into multiple displays. 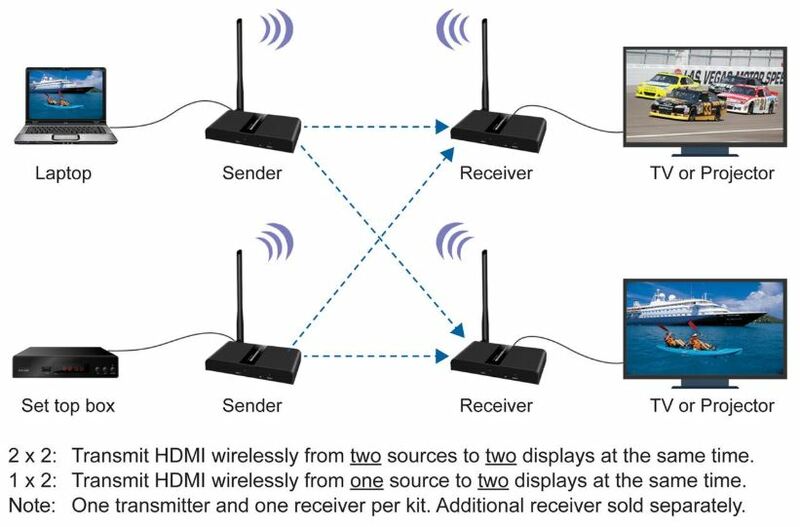 HDMI transmitters are almost always based around IR technology, which is now commonly referred to as 5G. Weaker transmitters are capable of moving a signal around 30ft, while stronger transmitters are capable of exceeding 500ft. Whether or not you need that kind of distance entirely depends on individual circumstances, but greater transmission distance is the one thing that will drive up the price of your kit faster than anything else. Transmitters and receivers tend to run hot, especially the transmitter. It’s useful to look for designs which are good at dissipating heat, which typically means either ABS plastic or aluminum. The thermal conductivity of aluminum is slightly better, especially when paired with proper venting holes. It doesn’t hurt that it looks great, either. Though you don’t need to become too concerned with heating unless you’re trying to operate the transmitter/receiver in 90-degree environments on a continuous basis. Another thing you might look for on the transmitter/receiver are swappable antennas. In most cases, you won’t need to swap the antennas. But it doesn’t hurt to have the option, and in the scenario that one of your antennas becomes damaged or disabled, being able to swap in a new one is much better than having to purchase a totally new transmitter/receiver. Good wireless HDI transmitters should be as easy to use as plugging in a USB drive. In reality, they’re often somewhat more complicated because you have to think about the precise location you want to position each unit. But beyond that, any good setup won’t require you to have to deal with special driver or software installation. You will have to think about how to run power to the transmitter and receiver. But any good wireless HDMI transmitter kit will provide you with at least a couple of options to make that easier. When you’re trying to get the transmitter and receiver to stay in line of sight, it helps if you can move them around a bit. 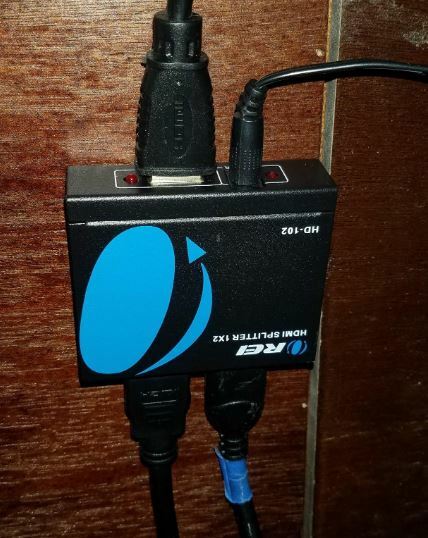 Sometimes a HDMI transmitter/receiver kit will provide extension cables and similar accessories, which can make it a bit easier to form a stable connection. Kits that don’t provide these kinds of extras aren’t necessarily bad because it’s usually possible to pick up your own extension accessories as needed. But there’s something to be said for having everything included with your kit. Even when it comes to something as superficial as cable ties, a few extra can go a long way towards making everything run smoother. The J-Tech Digital HDbitT Series is about as far as you can go with a wireless HDMI extender until you’re looking at military grade equipment. The 20-60KHz frequency transmission provides powerful IR blast that lets you send your signals across an expansive space. This machine can transmit a 1080p signal across 660ft. It’s probably the most powerful HDMI transmitter/receiver that you’ll find without looking for a specialty retailer. It supports two receivers simultaneously. The transmitter can send video to two separate receivers, which is great for broadcasting on a pair of televisions. The dual antenna transmission provides a generally more stable experience. Each transmitter/receiver measures roughly 5.1 x 3.3 x 6.4-inches. That enormous height, surpassing six inches, is due to the antennas placed on both sides of both devices. If you encounter an issue with height, those antennas can be lowered slightly depending on the angle of your connection. However, reception and transmission will decidedly be better if you’re able to angle and position those antennas appropriately. So it’s better not to squeeze them into a small space. Both the transmitter and receiver look nearly identical. Consequently, it’s unfortunately a bit easy to mix them up. At least, until you take a close look at the ports available in each unit. Only the transmitter needs an input cable, after all. Once you’ve got everything setup, this kit is capable of supporting 1080p content run at 60Hz. You can run everything down at 720p and lower as necessary. If you encounter issues where your signal isn’t coming through properly because of objects interfering with your transmission, taking it down to 30Hz is often able to help. Latency is about 300-500ms. That’s fantastic for casual home operation or business operation. It’s not great for using a PC or playing videogames. Because that’s latency that literally any person will be able to experience, no matter how refined their eye for detail. However, supporting 60Hz is something that console gamers will appreciate. If you end up using a complex A/V setup involving multiple transmitters, you should know that only one transmitter is capable of working when used in the same position. 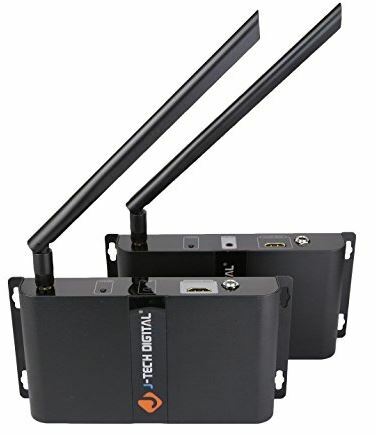 It’s worth noting these antennas can be detached, though given their considerable power, there’s really no reason to think about replacing them unless they become damaged. The J-Tech Digital HDbitT Series kit doesn’t include a bunch of extras, it’s closer to an essential starters kit. But it does include lifetime tech support from J-Tech Digital, as well as a one-year warranty. The Diamond VS300M is essentially a lightweight version of the J-Tech Digital HDbitT Series. Each kit includes one transmitter and one receiver, both units looking nearly identical. Though combined they can only provide a small fraction of the 660ft available with J-Tech Digital’s transmitter, offering 150ft, they still provide enough for most people in most circumstances. Of course, line of sight will affect those distances. If you’re trying to transit through a wall, you might find that 150ft quickly cut down to 40ft. It depends on the density of the wall. An insulated wall is almost as bad as trying to move a signal through brick. Each transmitter/receiver measures roughly 5.1 x 3.1 x 6.6-inches. That enormous 6” height is due to the antennas, which can be lowered slightly depending on the angle at which you adjust it. These otherwise slim and portable units can be made sensationally tall by the included antennas. Like with the previous member of this list, it’s worth noting these antennas can be removed. That can be useful for some types of applied installations, or for eventually swapping them out. The backside of the transmitter and receiver allow you to distinguish between the two units. The sender has an HDMI input, HDMI output, DC power port, and IR port. The receiver has a DC power port, HDMI output, IR port, and a pair of LED lights to help diagnose problems. The two units aren’t terribly distinct, but it only takes a moment to work out which is which. The VS300M uses the same 20-60KHz IR technology that powers the J-Tech transmitter. It also has a similar range of expandability. For instance, the VS300M can transmit from the sender to two separate receivers, though only a single receiver is included. You can pick up an extra receiver without having to buy another complete kit, which is pretty nice if you plan on running dual displays at some point. Even though this is far-and-away the best looking transmitter/receiver combo, the OREI transmitter kit is actually more like a middle point between the Diamond adapter and the J-Tech adapter. 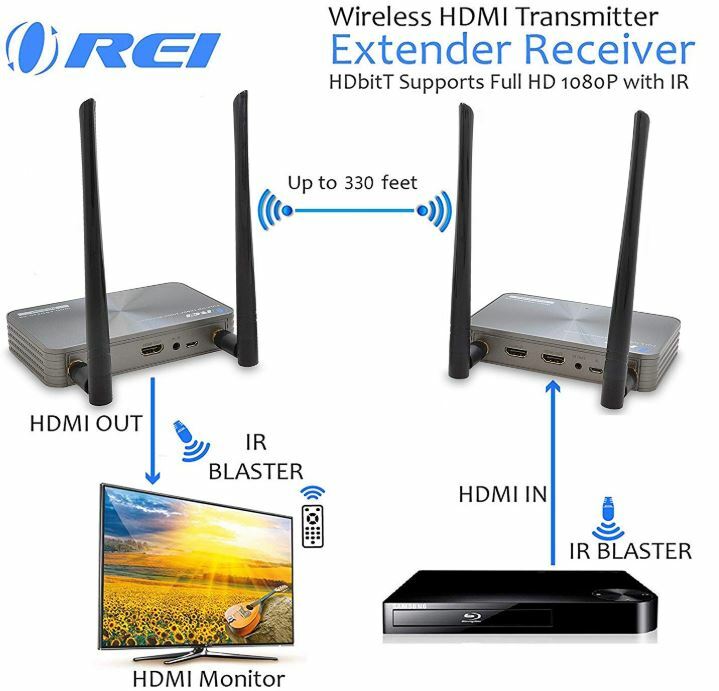 Making use of the 30-60KHz IR band, the OREI Wireless HDMI Extender Transmitter & Receiver can boost signals to a distance of 400ft. Not bad — not bad at all. Similar to the other transmitters on this list, OREI’s HDMI kit allows for a totally plug and play setup. That means no messing around with extra software installation. Each unit measures 5.2 x 3.3 x 1 inches, and each was constructed with an airbrushed aluminum chassis complete with glossy finish. Both units look stylish and professional. Though the attached antennas don’t fit the aesthetic, they do provide a sensationally powerful signal. They can also be removed and swapped with even more powerful antennas, should the need for greater distances arise. It’s really only the backside of each unit that lets you tell the transmitter apart from the receiver. The transmitter only provides an HDMI out port, while the receiver provides an HDMI in port. 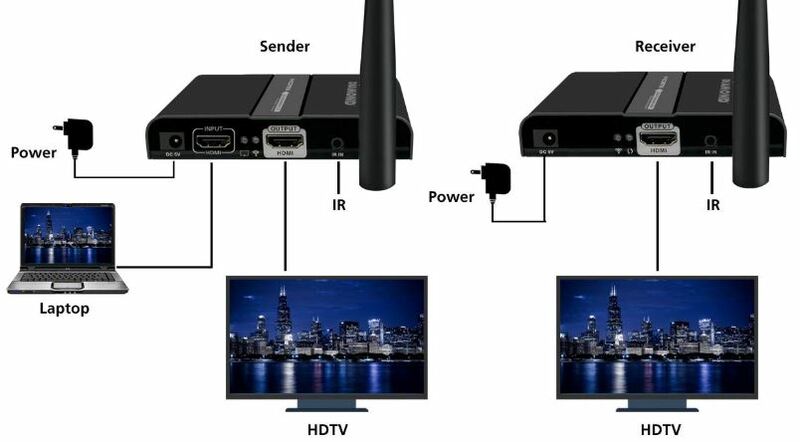 Both have DC power ports and an IR blaster located adjacent to their HDMI connections as well. This transmitter uses the 5G wireless band for minimal interference, and does so while providing relatively low latency in your transmission. Consequently, this adapter is quite formidable when used for streaming video. However, you do encounter some latency issues that will turn away people who are trying to operate PC screens. The latency you experience depends on the range the signal has to travel, but it’s between 300ms and 500ms. That will prove to be a barrier to some types of gamers, but shouldn’t disturb people who are trying to watch video content. It’s only when you start trying to interact with the screen that it starts to feel sluggish. For instance, if you were projecting a PC screen and dragging the mouse pointer along the screen, the pointer would certainly feel slow to you. The same sluggishness would emerge if you tried to play a fast-paced videogame on the connection. Though it might be an exaggeration to call the lag unplayable, there’s clearly a downside to interactive content on this display. The OREI kit includes the transmitter and receiver, a pair of power adapters, an IR emitter and receiver, user manual, and a one-year warranty from the manufacturer. You can also pickup extra receivers as needed, though they’re sold separately. The J-Tech Digital HDbitT Series is the right choice for someone who needs to transmit across a ridiculous distance. This equipment is pretty immaculate, though it doesn’t look particularly stylish, its outward professionalism is reflective of its inward capabilities. The 660ft connection is suitable for people in the unique circumstance of requiring their signal be broadcast across more than a tenth of a mile. The Diamond VS300M is the right choice for someone who doesn’t need an insanely long broadcast signal. It can run about 150ft, which should be suitable for most people in most circumstances. Setup is fairly simple and the antennas are swappable. The price isn’t particularly competitive, it’s closer to average in terms of the dollar per performance ratio. But the equipment is solid. 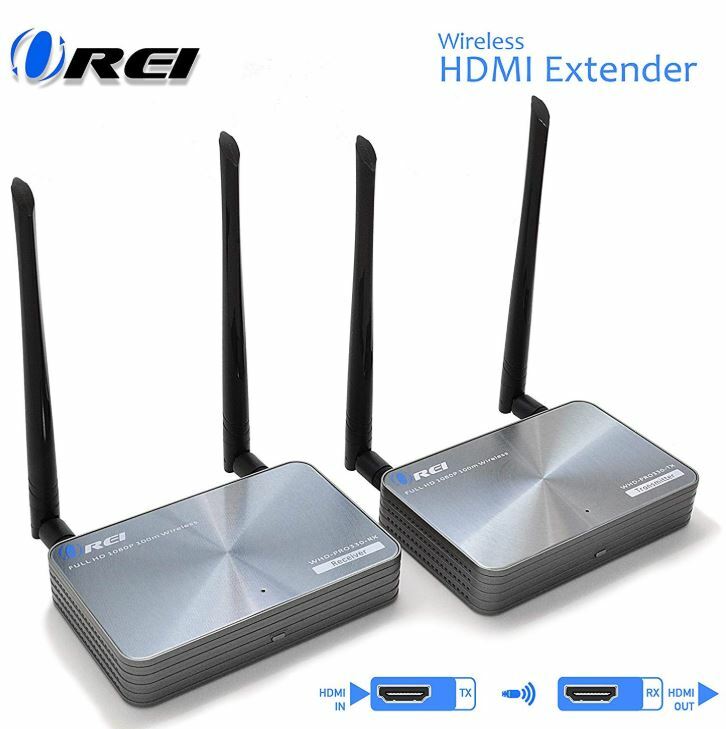 The OREI Wireless HDMI Extender Transmitter & Receiver is a medium point between the J-Tech Digital HDbitT Series, and the Diamond VS300M. That’s largely shown in its transmission distance of 300-feet. In terms of style, these HDMI transmitters are certainly the best looking on this list. It’s also capable of being adapted into a broader network that can broadcast a signal to two receivers. That makes the OREI kit the right choice for someone who needs more than 150ft of connectivity, but doesn’t need the ridiculous 660ft connection available through J-Tech. Why are these so damn expensive? Whoever makes the first one for $50 is going to be rolling in it. 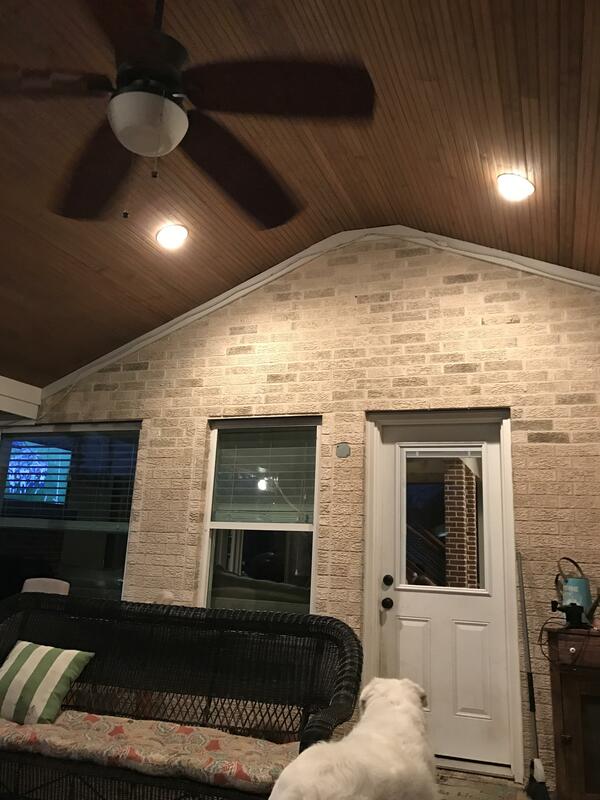 I am mounting a TV on my patio. The Comcast cable box is in the living room. There will be a brick wall between the Sender and Receiver. About 30 Feet between the 2. I am not very tech savvy. Can you please suggest one of these to purchase. Hi Techguru, I am doing business of rental LED walls with 3 or more camera’s close circuit, right now i am using sony 4k camera’s with wire. Our program area range is maximum 300 meters. in that regards can you suggests any wireless equipment by using that, i can present multi camera close circuit without any quality losses. If you are suggest me best solution in this regards which is great help for me and also you can suggest from whom i can purchase the same, assist me about pries and other related information, I am right now residing in India. Could you expand on your range test for the Aries Pro? I am thinking of using it in what should be absolute optimal conditions, complete line of site (outdoors) with no interference (15 miles from the nearest town) with the receiving monitor the only electronics within 2 miles (battery power for both Tx and Rx. Will I eek out more than 100′? do you think i’ll make it to 150? wanting to run my 1q3 foxtel upstairs to another tv .which one of these would you recommend. Could you use a ps 3 and 4 to these.